The Abilene High School basketball teams completed the season sweep of Concordia Monday night in Abilene. The games were make-up games from last Tuesday. In game one, the Cowgirls put last Friday’s loss at TMP behind them as they buried the Lady Panthers 61-23. It was the third victory over Concordia on the season for Abilene. 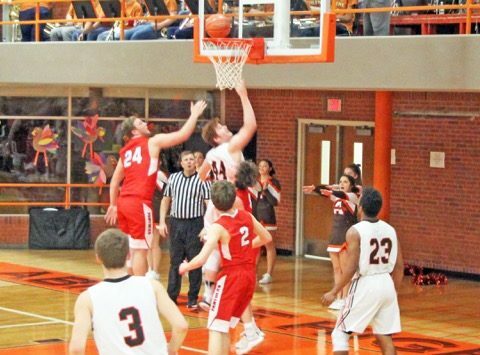 In the second game, the Cowboys pulled away in the 4th quarter for the 61-40 victory. In their victory the Cowgirls got off to a quick start and never looked back. They jumped out to a 27-3 lead at the end of the first quarter. They would lead 33-13 at halftime and extend the lead to 52-18 after three quarters to ensure a running clock in the final period. Abilene got a huge night out of Senior, Hannah Willey. She exploded for 13 points in the first quarter and finished the night with 28 points to tie her career high. She also scored 28 points in the first meeting with the Lady Panthers on December 14th. Abilene also got 10 points out of Senior, Sydney Burton. The Cowgirls improved to 11-2, 6-0 with the victory and Concordia dropped to 2-11, 0-7 with the loss. In the second game Abilene knew they would have a tougher match-up with Concordia than their initial meeting on December 14th. In that game, the Panthers didn’t have three of their starters in Sophomore, Wyatt Trost and Seniors, Corben Monzon and Dyelan Reed. Abilene blew out the undermanned Panthers team 88-39 that night. Monday’s game would be more difficult for Abilene. The Cowboys lead 14-11 at the end of the first quarter. The Panthers would get 5 straight points from Reed, in the 2nd quarter, to take the lead at 21-20 with 5:02 to play in the first half. A short time later Sophomore, Chas Carlgren picked up his 3rd foul with 4:28 to play in the half. Carlgren scored 21 points in the first meeting and entered the night as their 4th leading scorer and 2nd leading rebounder. He went to the bench and the Cowboys took off on a 10-0 run capped on a bucket by Senior, Tim Barbieri, that made the score 30-21 with :59 left in the half. Abilene would lead 32-23 at the break. The two teams were practically even in the third quarter as the Cowboys lead 43-33 as they entered the 4th. Abilene effectively used their bench and wore down the Panthers in the game. The Cowboys finished the game on a 10-0 run and outscored Concordia 18-7 in the final quarter. Abilene was led in scoring by Seniors, Preston Boyd 12, Tim Barbieri 10 and James Mayden 10. The Cowboys defeated the Panthers for a 10th straight time, won their 4th straight game and improved to 10-3, 5-1 on the season. Concordia slipped to 3-10, 1-6 with the loss. Abilene returns to action Friday at Marysville. The Panthers will host Pike Valley on Tuesday.